Oh dear! Did you see that, my friends? Did you see the sight of that ghastly 75 minute movie made in 1967? What? You didn't? But it was right there! Staring at us both straight in the face! Whilst being Directed by: James A. Sullivan; and Starring John Agar, Carol Gilley, Ralph Baker Jr., with Dorothy Davis. Hello. This is Joan Scott (Carol Gilley) speaking. And I was wondering if I could have a word with my fiancé, Sheriff Clint Crawford (John Agar)? No? He isn't available at the moment? Oh! Fair enough. 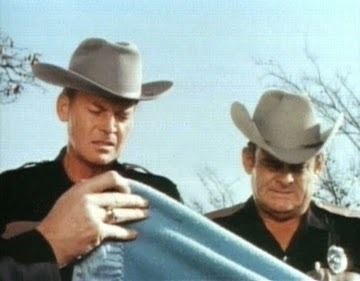 Maybe Clint's gone out to liaise with his old friend, Professor Clayton (Roger Ready), about a giant footprint he discovered, possibly connected to a strange series of mutilations nearby. Still. I was hoping I'd be able to catch him in his office, Desk Sergeant. Because earlier in the day he told me about these bizarre crimes, then a few moments later, I read a letter from my sister, Judy (Dorothy Davis), telling me that she and a group of her pals will be having a party at this said-same location. A location, I might add, that is dangerously close to that recent UFO sighting. Anyway. Don't worry yourself about my call. I think I try and head on out there on my own. But then again, that's most probably why what next transpires turns rather nasty when a shaggy looking creature attacks. As a UFO's origin's are finally explained - a killer party becomes somewhat stained - a Sheriff finds a way of standing his ground - and at the end of the day, an explosion causes an alien to jump around. I've got to be honest with you, dear reader, I was really hoping that 'Night Fright' was going to be one of those secret cinematic gems that come my way once in a while. Now I'm sure you know the type of thing I'm referring to. One of those real diamond's in the rough that nobody has ever heard of before. Sparking like a very sparkly-jewel in spite of its no-star-cast and made-for-television production values. But no. I was very-very-very wrong. And the reason why I was wrong lies heavily on the following three factors. Firstly, all of the 'teenagers' that starred in this movie were the most annoying people I've seen in a very long time. From my perspective they came across just like a bastardised version of the 'Happy Day's' characters. What with their tight fitting polo neck sweaters, beehive hair-dos, and 'gee-golly-gosh' attitudes. Except in this case I was rooting for the killer to kill them because they had no form of screen charisma whatsoever. Secondly, the story-line had a relatively strained focus to it. Sometimes it concentrated on the Larry character. Sometimes it concentrated on the obvious murder mystery. And sometimes it concentrated on the teenage characters. Yet by in large it just flimflammed between these three plot-points, giving the overall narrative a significantly jaded feel to it. Not really being one aspect. Whilst not really being the other aspect either. And thirdly, I best mention that the creature in this film -- as well as some of the sets utilized -- were f*cking crap to look at. Honestly. I've seen better cosplay costumes than the creature in this piece. It wasn't scary at all, and I wasn't too keen on how long I had to wait for it to bloody finally show up. Just so it could kill some of the f*cking annoying actors who starred in this... coff-coff... 'b-movie classic'. Anyway. I think it best if I stop myself there, folks. Cause if I go on any longer I may say something rude. So please stand back, and brace yourselves for the following filmic facts. (1) This $18 thousand dollar production was first released on the same month the Beatles released their ill fated album, 'The Magical Mystery Tour' -- November, 1967. (2) James A. Sullivan, who was the director that directed this film, has only ever directed two projects throughout his somewhat bumpy career. This one, as well as another picture five years later, entitled, 'Fair Play'. (3) The majority of this movie was shot on location throughout the American state of Dallas, Texas. 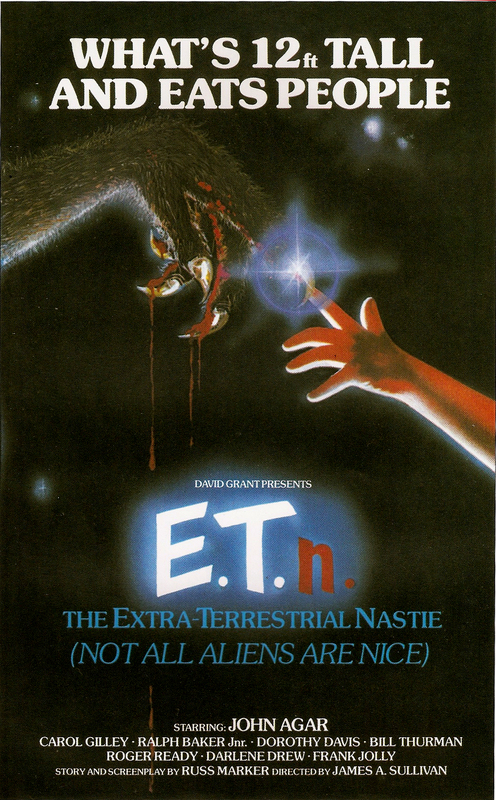 (4) This flick was given quite a few names during its existence, including 'Fright Night' or 'Nastie' in Spain, plus 'E.T.N. : The Extraterrestrial Nastie' in the United Kingdom. (5) Now if you took any notice of my previous fact, you might like to know that when this adventure was eventually released in England during the early eighties, its VHS cover was a doctored version of the Steven Spielberg 1982 classic, 'E.T. the Extra-Terrestrial'. (6) The score for this b-movie was composed by the noted musician, Arthur Sullivan, who was awarded a knighthood by Queen Victoria in 1883. (7) In a similar vein to James before him, the writer of this film, Russ Marker, has only written two projects throughout his somewhat spacious career. This one, as well as a science fiction film four year earlier, entitled, 'The Yesterday Machine'. 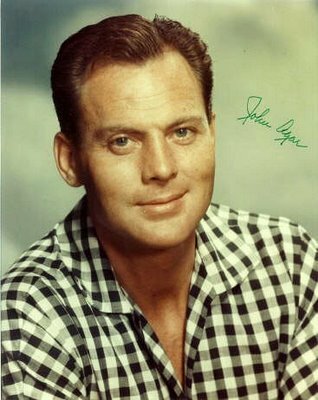 (8) After this flick scared itself witless, John Agar starred in the television series, 'Hondo'; whilst Carol Gilley and Ralph Baker Jr retired from show-business altogether. Overall I'd have to say 'Night Fright' felt more like 'Dog Sh*te'. Granted, John Agar and Carol Gilley were pretty good in this picture when they were allowed some screen time. Having said that though, the story-line was too obvious, the teenage actors were too annoying, and the monster was too... errr... how can I put it? Oh yeah! Crap. Nuff said.